Our new cement mixer lid has been modified to fit the belle mixer perfectly. Being slightly larger under the handles means it fits perfectly and yet on the other sides is slightly smaller which means it still it’s the misshaped belle mixers. Our new cement mixer lid is the only one of its kind. It is a registered design, meaning you won't be able to get the same product anywhere else. 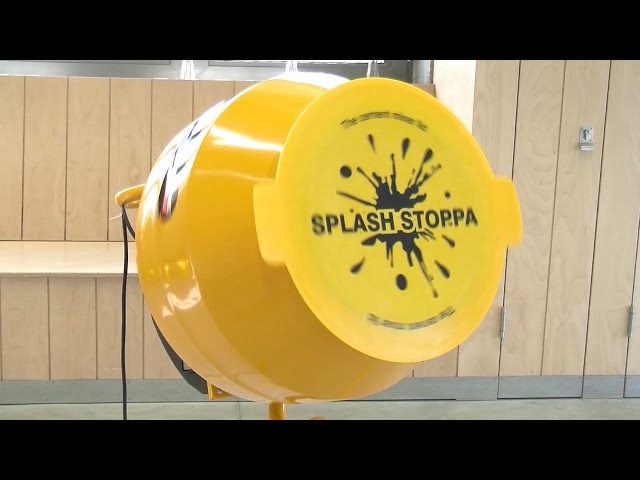 The Splash Stoppa is designed to make cleaning cement mixers safer. Ensuring that safety is paramount, its main feature is to prevent cement splashing in the users eyes when cleaning a cement mixer . Its innovative design also prevents damage to patios, paths, buildings and clothing. The Splash Stoppa can be left on the mixer over night enabling you to store tools inside the mixer without them getting wet. It is constructed of a durable Polymer material that conforms to British Standards, is easy to clean and easy to fit due to the external handles. It can be fixed whilst mixing or cleaning and will fit all Belle cement mixers, no matter how old, having been designed to fit loosely makes sure it's easy to fit as after many attempts to create a tight fit then it was soon realised that there will always be a belle mixer that it won't fit. So with this in mind the only way was a loose fit so it is guaranteed to fit all the misshaped mixers and the ones with hard cement on the rims. Simon is the founder of Splash Stoppa and simply a builder who enjoys his work and gets satisfaction from completing projects for clients. He was sick of all the mess from a cement mixer so he set about designing a lid. Simon decided to design and have manufactured a cement mixer lid to fit the main cement mixers that builders use which is the Belle models. In the past he used a old bin lid but this didn't quite fit right and was heavy as well as being really hard to get hold of one. He was fed up of getting splashed whilst cleaning his cement mixer which is what spurred him to go ahead. It took him sleepless nights and a lot of stick from his mates about inventing a lid, but eventually came up with the lid design and from having the lid manufactured to displaying at trade shows to going on Dragons Den he finally got there. Simon says "As a builder you get fed up of people giving us all a bad name about being messy or just rough and this is not always the case, some of us are quite good and do a good job and are not all dodgy, which made me want to at least stop some of the mess on site. My customers love the fact that we make the effort by using the lid to prevent mess going on their property". The cement mixer lid prevents splashes while cleaning your cement mixer and certainly stops you getting cement burns or eye splashes leaving you to get on with further jobs whilst leaving the mixer cleaning unattended. Watch our latest video to find out more about the Splash Stoppa. Discover how we make cleaning out a cement mixer safe and easy. A little dubious about new products but it does the job and the price was right too. After years of using a old bin lid I came across this on the net and thought I would try it, well it works and is easier to clean and lighter than my old bin lid. I purchased a cement mixer lid as i too was fed up of the mess when i cleaned my mixer. needless to say it does what it says on the tin. Great product and came on time. Splashstoppa is a great bit of kit. I wish I had got one years ago saves a lot of cleaning and damage! It does exactly what it says it will, a genius idea. At last a new and innovative British designed and manufactured product, that finally does fit a cement mixer and eliminates mess or injury when cleaning the mixer after use. If you own a mixer as a builder or personally this is a must have product. Well done Splash Stoppa. What a brilliant tool !! Better than a bin lid , why anyone would use a bin lid when theres a proper lid I'm unsure, but they do enforce that a lid is required and it certainly is, also it stops the cement splashing in my eyes when i clean my mixer as I'm a lady and don't want cement on my face when i walk past. A real time saver and easy to wipe down. Will it Fit My Mixer? The Splash Stoppa will fit the following cement mixers which have a internal drum size of approx: 397mm Cement mixer lid size: 385mm Belle range : Belle Mastermix Belle Minimix Belle Maximix. It also fits battered drums, providing they fit within the Splash Stoppa dimensions, DIY cement mixers, site cement mixers and inside brand new drums. Designed for the pro-builders and Belle cement mixers, our cement mixer lid is loose fitting - making it easy to fit, unlike a tight fitting lid which takes effort. Especially designed loose means it will fit battered drums and certainly fit new drums as described below, even with excess cement on the mixer rim. Priority being to reduce splashes from your cement mixer when the cleaning process is in operation. The perfect solution for how to clean a cement mixer safely and without creating mess! Did you know that last year alone there was over one hundred and twenty five people who sought hospital treatment for eye and facial injuries associated with splashing from cement mixers during the cleaning process, with many more cases going unreported. The Splash Stoppa helps you prevent injuries on site. The Splash Stoppa is a MUST have for builders. Start saving time on cleaning, and prevent harmful splashes and damage today.